Wayne Gretzky, then with the Los Angeles Kings, made a big impression on Mike Myers, star of the upcoming film "The Love Guru", when the two crossed paths on the set of Saturday Night Live. The Love Guru, the highly anticipated movie from Mike Myers, debuts Friday in theaters across the country. The film stars Myers as Guru Pitka -- Myers’ first original character since Austin Powers. Pitka is an American who was left at the gates of an ashram in India as a child and raised by gurus. Eventually, he moves back to the United States to seek fame and fortune in the world of self-help and spirituality. His unorthodox methods are put to the test when he must settle a rift between Toronto Maple Leafs star hockey player Darren Roanoke (Romany Malco) and his estranged wife. After the split, Roanoke’s wife starts dating Los Angeles Kings star Jacques Grande (Justin Timberlake) out of revenge, sending her husband into a major professional skid -- to the horror of the team’s owner Jane Bullard (Jessica Alba) and coach Cherkov (Verne Troyer). Pitka must return the couple to marital nirvana and get Roanoke back on his game so the team can break the 40-year-old “Bullard Curse” and win the Stanley Cup. Recently, NHL.com and other national media outlets took part in a conference call with Myers to discuss the movie, which features the exploits of his favorite team, the Toronto Maple Leafs, playing his favorite sport, hockey. It was also a chance to re-write history, so to speak, as Myers brought in the Los Angeles Kings – and Justin Timberlake as goaltender Jacques Grande – as the rival to his beloved Toronto Maple Leafs. Was it a chance at redemption for 1993? Not entirely, Myers said. 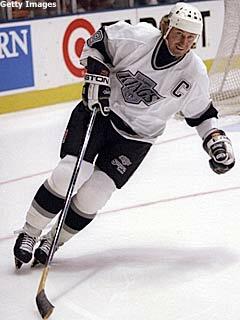 “I think the Kings won that series fair and square, and Wayne Gretzky just proves himself to be the champion that he is. As Myers said in the first edition of his podcast, he does not harbor any bitterness toward “The Great One,” as Gretzky was, and still is, one of Myers’ heroes, a hero he was even able to work with during an episode of Saturday Night Live many years ago. He recounts the story of what it was like to look down the “upcoming hosts” list on the SNL set, only to see Wayne Gretzky’s name a few slots down the list. He couldn’t have been more excited. “And it was, you know, I was just, you know, from Toronto and here I am on this show in New York City and I see Wayne Gretzky’s name,” he said. “And I dove on the phone as if it were a grenade just to call my friends and family in Toronto. It’s something Myers still cherishes to this day. Especially since Myers usually has no time to fraternize with everyone on the sets to his films, or even see the cities their based in. “You end up having so little time to do anything except prepare for the next day’s work and kind of write stuff,” he said. “And fix stuff and write stuff, and fix stuff. And I didn’t get as much time with the players as I thought there was going to be. It was an experience he’ll never forget, and it produced an autographed photo with which he’ll never part. “That’s a holy grail right there,” he said. * The use of Mark Ellis as choreographer of the film’s hockey sequences, and the realism and authenticity he brought to the set -- and to the film as a whole. * His experience working with Wayne Gretzky and other NHL players. * What Romany Malco was like as a skater and what Justin Timberlake was like as a goaltender. Hint: they both surprised Myers with impressive abilities. * Finally, Myers expresses thanks to the National Hockey League, the Maple Leafs and the Kings, all of whom opened its respective doors to Myers’ vision.